And it Begins…Marathon Training | Run, Lindsay, Run! Loved running with you yesterday — and love that we all refueled at some point with 16 Handles. Hehe. Let’s absolutely do it again. Enjoy the rest of your weekend! Like you, I’m also getting the longer runs in earlier in this training cycle. Here in TX, that means getting out the door by 7:30 on Saturdays– no more “getting up whenever” like I did in NYC last summer! I typically do a longish run on the weekend or a run with a friend. I’m terrible about getting my lr done in the am but know I need to this time around with the summer heat (prev marathons have been spring). My fave workout this week was the race today! I’m pretty shocked with how I did considering I’ve done 1 workout since may and just leisurely jogs beyond that. Two friends of mine and I ran the whole thing together and crossed the finish all cheesy holding hands. It was fun, beyond that throw up omg going to die feeling. Looks like a great first week of training! Getting done what you want to get done + having fun while doing it is the best. You ladies are so adorable – love the unplanned coordinating outfits 🙂 I always do best when I get my long runs done in the AM, especially in the summer heat, but on vacation/weekend getaways that doesn’t always happen. All of your NYCers and your 16 Handles are making me want froyo so badly! Man, I wish I was as fast as you girls to join! Maybe one day! My marathon group meets at 6:30 am every Sat…SO hard to wake up that early. And the worst part about getting up that early is that it STILL is hot out. Sigh. That fro yo has tons of colors going on so that means tons of nutrients, obviously. I try to do my weekend runs in the morning to free up my day, but it doesnt always work out that way. I’d much rather go for a evening run anyway. I’m so jealous of your long run…hopefully I’ll be able to join in on one soon! Now that it’s summer, I hope to get my long runs in early, although I am NOT a morning person, so sometimes that doesn’t happen. Gone are the days of winter when I could run at any time of day! Best workout this week? Had some good mile repeats! Wow, I’m so glad I just discovered your blog! I’ve never met Ali, but Kelly and Megan are totally awesome:) 16 Handles is totally the best post-run recovery food. I’m actually attempting to run a sub 3:00 NYC marathon this November also, so let me know if you ever need a running buddy. We could motivate eachother to maintain a faster than normal pace! Woo hoo! Great running! You are still my running hero and always will be ya little speed demon ;-). 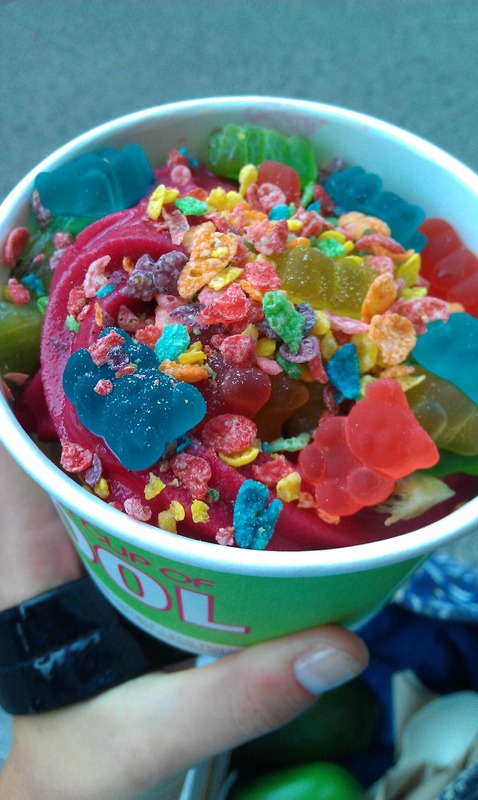 It’s 9:30 AM and your post made me crave 16 handles…..